It’s the age-old story: girl goes to graveyard to find her missing father, girl digs up grave, girl falls through ground, girl’s still-beating heart is stolen from her chest by an evil wizard, girl now has to move to the rhythms of the wizard’s music. 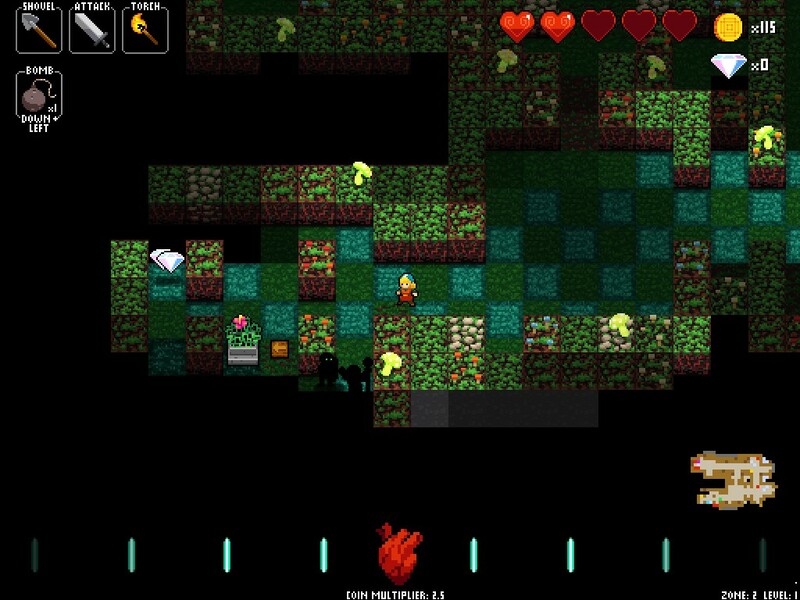 OK, maybe that’s not one you’ve heard before, but it is the story in Crypt of the Necrodancer. 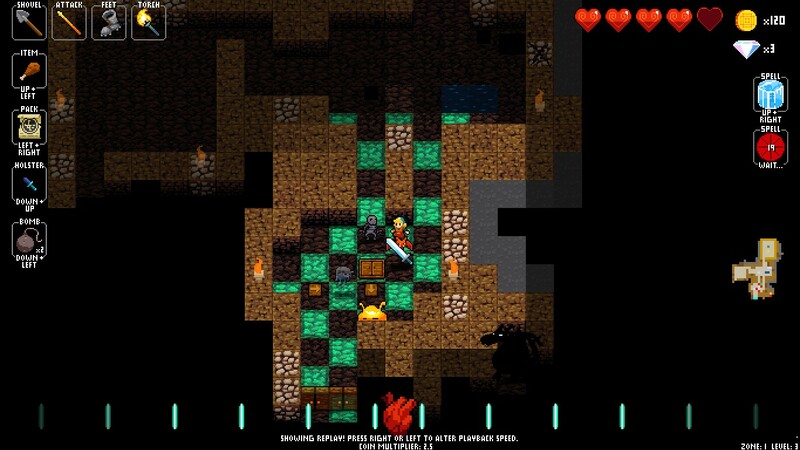 Because of the control that the Necrodancer has over those in his crypt, all of your actions have to be done to the beat of the current floor’s music. You can move, attack enemies, use an item or dig through a weak wall on the beat, but enemies will also act on the same beat. If you miss the beat, you’ll lose your multiplier (for bonus gold). Plus, your character will do nothing for that beat. When you’re in a dangerous situation, that can get you killed, so the first thing you need to do is to get so good at playing to the beat that you don’t have to think about it and can focus your mind on the dungeon around you. At first, it’ll be a battle between basic weapons and basic enemies. You will always start with a dagger that can hit one space directly next to you. This is enough to take out slimes that jump up and down continuously or skeletons that will do a jumping attack towards you every other beat. But, when you encounter things like dragons that can fire a laser in a horizontal line, you might want to keep your distance with the spear or the whip, or even the much more complicated crossbow. I would be missing quite a lot if I only mentioned weapons, though. There are all kinds of armor, spells and accessories. You can heal yourself, blow up a group of enemies or even change all the items on the ground near you into other, random items. Boots that let you hover above traps and ice? Always welcome. A favorite of mine is a miner’s helmet that digs out every breakable wall in a 1-space radius from you, automatically, every time you move. Of course, that often gets me into trouble because it’s that much easier to run headlong into danger, but I have fun nonetheless. Getting access to all these cool items is a two-step process. First, you have to get the gems that are hidden in the dungeon so you can buy the items back at the lobby. Once you do that, they are unlocked to find at random throughout each dungeon. You still start your journey with just the dagger, basic shovel and a couple of bombs, but you know that better things are waiting — either in gold shops or treasure chests — so your chances do improve over time. Eventually, you’ll unlock a special shopkeeper in the lobby that has a random selection of items. You can buy them with gems to take on your next run, so, even when you unlock everything, the gems will still keep helping you as you go on. 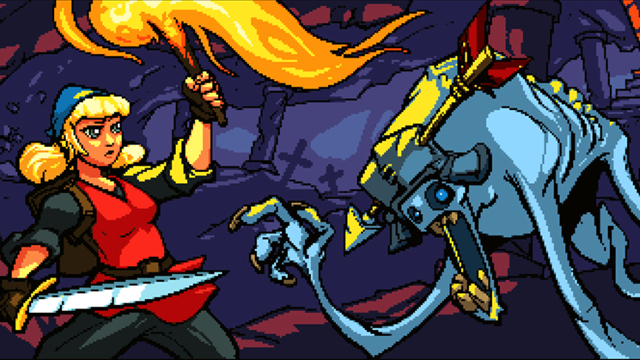 The gameplay in Crypt of the Necrodancer is further mixed up by the variety of playable characters. At first, there will only be two characters unlocked: Cadence, the sort of default character that’s featured in the story, and Bard. Bard throws the rhythm aspect out the window and allows you to play the game at your own pace — stopping to think your way out of a situation, or rapidly hopping across the map. I used him for a while to get the hang of the dungeon, items and enemies before I was ready to play Cadence. Still, even though Bard probably makes the biggest change to the gameplay, he’s not the only one. Dove can’t attack enemies, but she will never encounter a locked door, so she can escape more easily. Monk is damaged if he touches gold, but merchants give him items for free. And so on. However, in order to experience the storyline, you do have to finish the game with Cadence. By doing so, you’ll also unlock Melody, who, in turn, unlocks Aria, finishing the story off. Each zone you complete with these three gives you a piece of the puzzle, telling a story of family and loss. You’ll learn what Cadence’s family has to do with the Necrodancer, and where he came from in the first place. It’s an oddly epic, generation-spanning tale, especially for the very short and minimal scenes with which it’s told. Though you can easily customize the soundtrack, either from the Steam Workshop or your own music library, I didn’t see any reason to use that feature. Each floor in each zone has a specific tune, as do all of the bosses. Cadence and most of the other characters — by default — hear these in a lively techno format. Melody converts those same songs to a darker, more industrial or dubstep type of feel, and Aria brings them all the way to heavy metal. You can choose to match any of these soundtracks to any character in the options, or even have it randomly alternate between them. What really makes these songs memorable to me, though, is that, any time you are near a merchant, he will actually sing along to the music. Nice touch! The graphics stay faithful to the 16-bit aesthetic on which they’re built. The environments have a nice little textured look, overlaid by the “disco floor,” a checkered pattern that alternates positions and colors every beat as long as you have at least some multiplier. The interface, items and characters have a slightly more cartoon quality. Cutscenes are rendered as pixel art with somewhat limited animation; I once saw the process and it turns out that the artist creates a more clean-looking picture before passing it through a filter that makes it look more 16-bit. As far as play hours go, it would be tough for me to give a real number. I had put in about eight when I finally got up the skill to finish the game with Bard, but there are challenges where you go through the entire game with Cadence in a mere 15 minutes. There’s even a full story mode, where you try to go through Cadence, Melody and Aria’s stories consecutively without dying. Otherwise, you can go for the daily challenge, a seed for all the zones that’s shared across the world to make high scores as fair as possible. 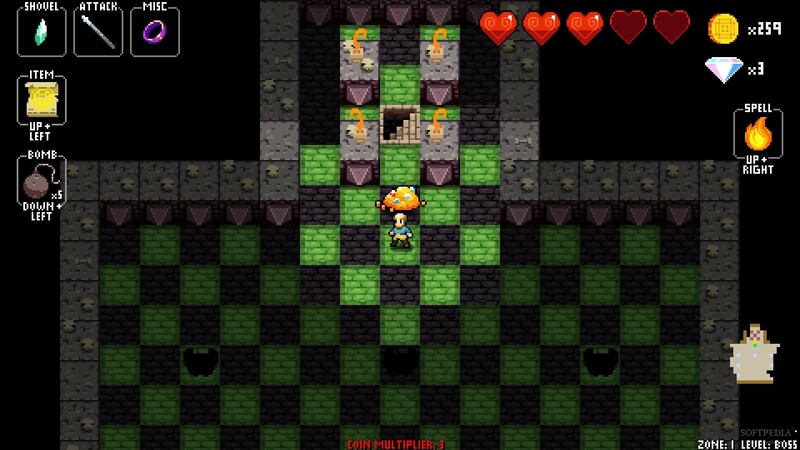 Plus, you can always try custom dungeons or other mods from the Steam Workshop. Altogether, these things bring replay value up to a new height. Did I mention local co-op? 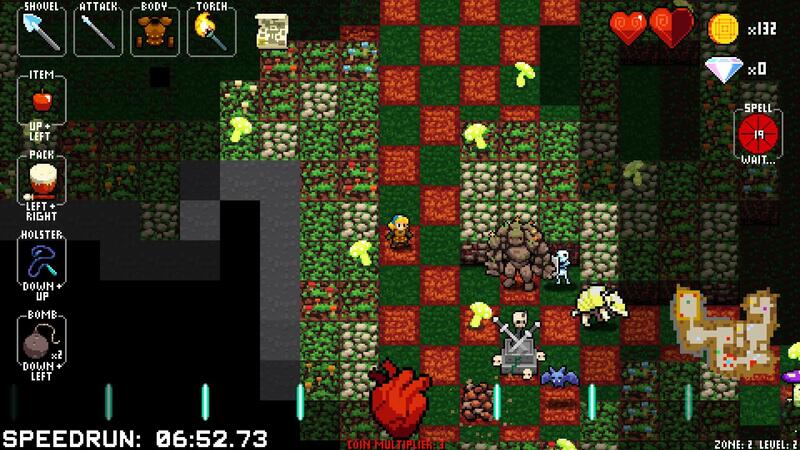 In other words, Crypt of the Necrodancer offers truly uncountable hours of fun, jamming out to the beat, braving the dungeon and hoping for better luck next time. Every time I go into the game, even to verify a small detail, I fear for the hours of my life that will casually slip away. If you think you can handle that, definitely grab this game for $14.99 on Steam.